Preheat oven to 375 degrees. In a mixing bowl, whisk together flour, cocoa powder, cornstarch, baking soda and salt, set aside. Add butter, shortening and sugar to the bowl of an electric stand mixer and mix on medium speed until very pale and fluffy about 4 minutes. Add egg and egg yolk and mix until combine. Add vinegar, vanilla and food coloring and mix until well blended. Slowly add in dry ingredients and mix just until combine. Mix in 1/2 cup white chocolate chips. Scoop dough out by the heaping tablespoonfuls (about 1 1/2 Tbsp) and roll into balls and place on buttered or Silpat lined cookie sheets. Gently press about 6 white chocolate chips into the top of each cookie, being careful not to flatten the cookies (if you do flatten them a bit just reshape them to the height they had before adding the chips) and bake in preheated oven 8 – 9 minutes. Allow to cool several minutes on baking sheet before transferring to a wire rack to cool. Store cookies in an airtight container. 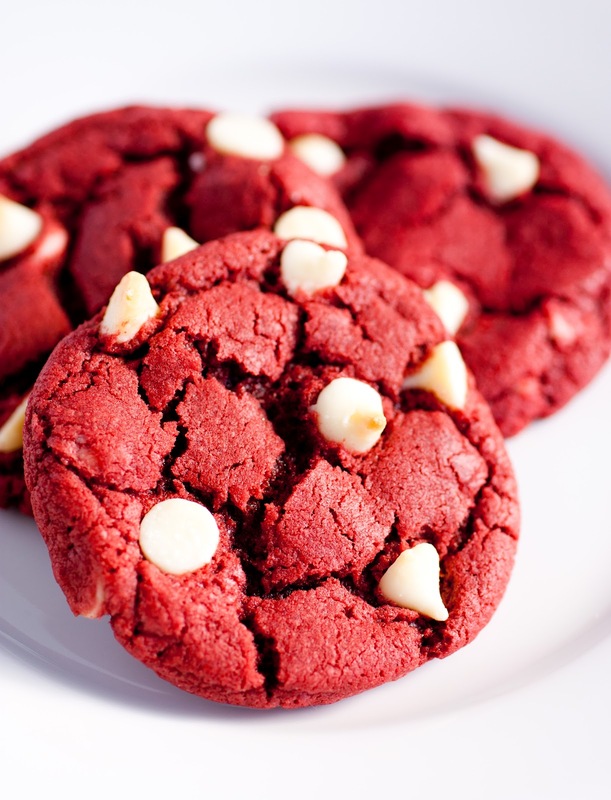 *If you want a more chocolaty cookie you could replace 1 – 2 Tbsp flour with an additional 1 -2 Tbsp cocoa, the red just won’t be quite as vibrant. Or, you could replace the white chocolate chips with chocolate chips. **Note: this recipe has been completely revised as of 9/7/12 due to comments stating cookies are flat and not red enough. I myself thought them to be flat. This recipe completely eliminates both of those issues. These are thick, vibrantly red and completely delicious (they better be, these were my 4th batch. Fourth times a charm right =).